Create your next memory in the luxurious oceanfront condominium located on the 5th floor. There are unobstructed views of the Atlantic Ocean. Watch the sunrise and beautiful moon setting over the ocean, from your private balcony and you just might catch a glimpse of dolphins swimming or the rare sea turtle nesting. 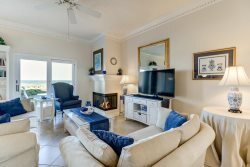 Ocean Place is a private gated community with 24/7 security and is located on the southern end of Amelia Island. You master bedroom has a king size bed with a separate tub; walk-in shower and good size open closet. The guest bedroom has 2 twins beds with a private bath with a tub/shower combo. This unit has a fully stocked kitchen with a breakfast bar and updated appliances. The living room/dinning room is open with views of the ocean. This non-smoking unit has 2 sets of sliding glass doors out to your balcony, one off the living room and one off the master bedroom. Book your stay with Amelia Rentals and let us help you make everlasting memories. Ocean Place is located adjacent to The Ritz-Carlton and Golf Club of Amelia on the southern end of Amelia Island. Bedding is King & Twins. Parking is Limited - 1 parking pass only.